Romford RM Commercial & Domestic Rubbish Removal | Quality Property Care Ltd. Call the warm and friendly customer care service or get in touch with it online with a description of the junk you need removed and disposed of, and you will obtain a primary estimation of the price of the junk removal service. 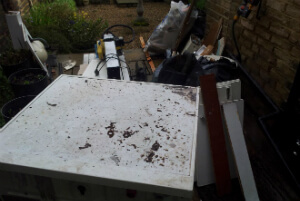 No matter what you need cleared out and removed, you can rely on the trained, experienced and vetted personnel of Quality Property Care Ltd. to collect the junk, and take care of the disposal of various types of rubbish carefully and in accordance to all regulations at a great price. After you receive the primary price estimate and book a visit, the rubbish removal operators will come to the spot, and calculate the actual price in accordance to the specific type, volume and quantity of the stuff or other waste you need to get rid of and dispose of. The waste will be loaded, transported and disposed of based to all polices for green waste disposal. For households we can accommodate any dimension of rubbish removal, from a few packages and boxes to a big load of junk. All of the elements we dispose of will be driven to the closest location for recycling, with all of the charges and fees covering not only our work but also any fees that apply to the proper disposal of the materials and waste. It is prefered that your junk and rubbish are all package up, even so, we can deal with that as well. We can remove single mattresses, kitchen units, tables, TVs, dryers,, 3 seater sofas, armchairs, double mattresses, 2 seater sofas, , ovens, microwaves, king sized bed, microwaves, divan beds, mirrors, washing machines, PC monitors, cupboards, wardrobes, books shelves, bathtubs, carpets single beds, freezers, TV stands and much more. Items like fridges and fridge doors, tires, TV’s, air conditioners, microwaves and such require additional fees for proper disposal. We can remove both industrial and household construction materials from sights, starting with timber, wood, metals, plastic, glass,cement, concrete, rubble, soil, tiles, plasterboards, bricks, and ceramics. Here we charge by weight for construction products with the most typical materials being timber, rubble, cement and soil. Once you arrange the rubbish removal service, we will sent to you the tested and vetted specialists. They will evaluate the volume of junk and will arrange a particular date. Make a combo with junk removal service and any of our expert cleaning services to get a unique discount! Our rubbish removal company delivers a full range of eco-friendly and competitive cleaning services that can fit in any budget! We are also able of removing garden and organic waste starting with grass trimmings and cuttings, soil and turf, hedges and hedge trimmings, garden weeds, plastic liners or bags, plants and flowers, small branches, litter, leaves,, twigs, animal bedding or straw, Christmas trees and decorations, plant pots and quite a lot more. There are special collection points where we will leave these materials, however, there are special fees that you may possibly have to take care of. There are materials which we do no collect like unsafe substances the most common of which is asbestos, we do not remove paint, chemicals,, medical products like syringes and medicine,, nor do we remove food. Depending on the type and size of the work we use several vehicles with different crews which is specialized in various fields. 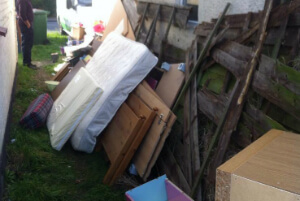 Contact us 020 3746 4287 anytime you want proper junk and rubbish removal from your residence. We work fast and efficiently, dealing with loads of all sizes from small to large ones. Get in touch with us at any time of the day or evening, you will get proper info on our pricing, details about the removal etc. Our crew is available free of cost, with booking form availability. Call up and save not only time, but also money and efforts.